Developer Quote: "Listen to two different songs on your headphones with your friends or your girlfriend using Double Music Player." I must admit when I found this app today, a flash bulb went off in my head instantly. 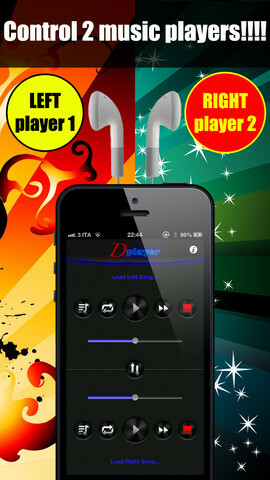 Music is something everyone enjoys, but when one has no way to play his or her music (whether due to an iPod/iPhone out of juice or because the beloved device was left at home), then Double Music Player is the only way to solve that drastic problem! Yes, and with 2 kids in the back seat, travel can become quite an enigma with one device only on a long road trip! This very cool music player iPhone app lets you share your headset so that you can place one bud in your ear, and your friend (or family member) can listen using the other bud. Suddenly, hey presto you're both listening to music but very different songs - no need to get stuck with your partner's appalling music preferences! What a very unique way to be close in one way, yet different in the other way depending on your musical tastes! There are many instances in which you can enjoy Double Music Player: two kids in the car's backseat each listens to what they like, friends on a hot sunny beach relaxing can share the fun, riding home on the train with a friend you can be kind and lend them an earbud, or just chilling with your significant other you can be close while listening to the sounds each of you prefer! Do you have any other equally illuminating thoughts on how you can use this practical and handy music player? 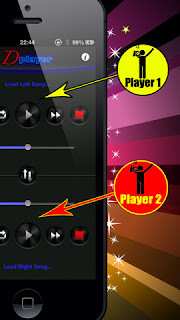 COOL PLUS POINTS: Double Music Player is like having two music players, (because we all have different tastes in music) loaded with snazzy visuals and comfortably simple controls. COOL CONCLUSION: No need to sweat it, if you mistakenly left your iPod at home-be a pal and share the music with your friend using one headset, but listening to two different songs using Double Music Player!